The other day when I was baking Vanilla Apple Pear Cake, my hubby brought home a carton full of apples while I needed only two for baking the cake. So there are a bunch of apples still in the refrigerator waiting for their turn to be used. With intent to put the apples to some good use, I thought of incorporating them in my soup. Besides, as some serious endeavors to shed weight are underway, this carrot apple soup is exactly what I need to feel my tummy filled without any guilt afterwards. Addition of butter into this soup is absolutely discretional. It will taste yummy regardless of butter or any other taste boosting agent. 4) About the remaining apple, core it and cut it into thin slices without peeling and squeeze lemon juice over it. Place the slices then in a bowl and heat them gently. Let simmer for 1-2 minutes until apple is tender. (Do the same in microwave for approximately 3 minutes.) Set aside until ready to serve. 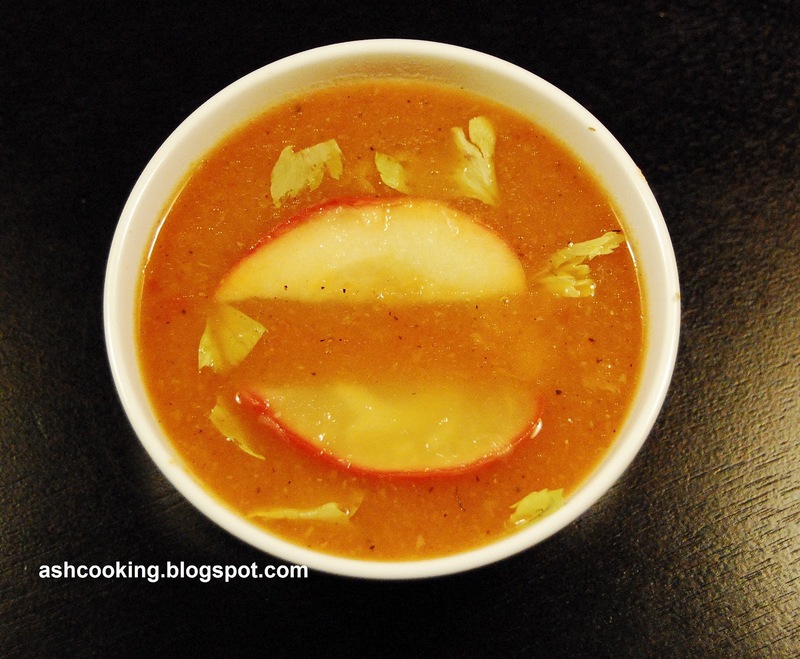 5) Ladle the soup into serving bowls, top with apples slices and shredded celery leaves. Serve immediately.